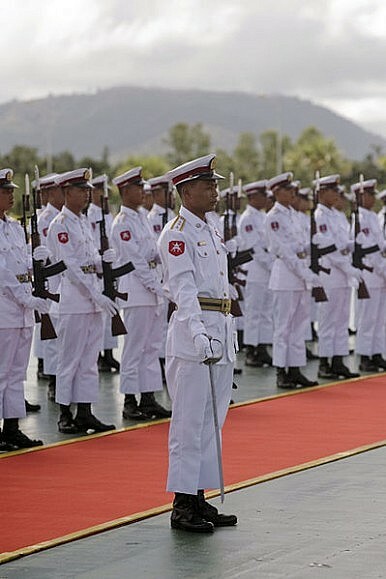 Myanmar soldiers at a 2010 reception. Once again, Chinese citizens are caught in the crossfire of Myanmar’s ethnic tensions. On May 14, several Chinese citizens were injured during a Myanmar government shelling operation against armed ethnic rebels. Radio Free Asia, citing local sources, reports that eight people in the township of Nansan were injured in the blasts. Witness reported five separate explosions in a half-hour period on the evening of May 14. One resident told RFA the incident wasn’t an isolated occurrence: “There have been bombs exploding a lot in recent days, and a lot of people are terrified.” Residents also reported gunfire from the fighting hitting buildings in their town. Now that the crossfire of Myanmar’s conflict with ethnic Kokang rebels has again spilled over the border, China’s government will face increased domestic pressure to act. Local residents who spoke with RFA are complaining that the central government and military are not doing enough to protect them. “These incidents have happened many times already, without the [Chinese government] dealing with it in a resolute manner,” one local said. China’s Foreign Ministry confirmed the incident in a press conference. On May 20, Foreign Ministry spokesperson Hong Lei said that China had “lodged solemn representations with the Myanmar side over the recent landing of shells in China that injured Chinese border residents.” Hong said Myanmar’s government promised to provide a formal explanation for the incident. “The Myanmar side is required to carry out serious and thorough investigation, give a responsible explanation to China, take concrete and effective measures to prevent this kind of incident from happening again,” Hong emphasized. Myanmar’s government has suggested that rebels, not government troops, were responsible for the shelling. The director of President Thein Sein’s office said the shells were not from the heavy weapons used by the government, according to RFA. Myanmar’s government similarly tried to escape responsibility for the fatal March 15 bombing, but eventually accepted the findings of a joint investigation with China that concluded government planes were at fault. Myanmar’s government promised to punish those responsible for the bombing and compensate the families of the victims. In an article for The Diplomat, Xue Li of the Chinese Academy of Social Sciences wrote that China’s policy toward the Kokang conflict “has many disadvantages,” including the possibility of domestic anger at repeated injuries to Chinese citizens. Xue suggests that Beijing should demand that Peng Jiasheng, the leader of the Kokang rebels, enter into negotiations with the government — and if Peng refuses, China should increase military and financial support to the government troops seeking to defeat Peng. However, China should also encourage Myanmar to grant more autonomy to Kokang, which could play a vital region in China’s “One Belt, One Road” plan, Xue says.